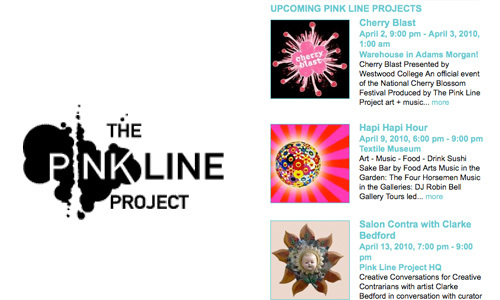 Over the weekend I was introduced to The Pink Line Project which is a website dedicated to art in the DC area. It’s a great resource for art lovers providing an up-to-date calendar of events and reviews of art in the area. This entry was posted on Wednesday, March 31st, 2010 at 10:35 am	and is filed under art, DC, inspiration. You can follow any responses to this entry through the RSS 2.0 feed. You can leave a response, or trackback from your own site.